The following case is from UFOs NorthWest, and is used with permission. 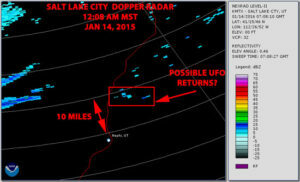 DOPPLER RADAR PAINT NEAR LOCATION & TIME OF UFO SIGHTING. This case was reported to me by Erica Lukes who is the director of MUFON for the state of Utah. She knows a radio show host who was scanning communications between aircraft and the FAA shortly after midnight on January 14, 2016. He heard a conversation between an airline pilot and Air Route Traffic Control. The pilot reported seeing an extremely long bright object that he estimated a mile wide to his right. 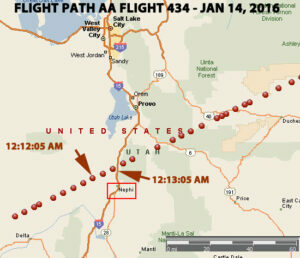 The air traffic controller told him that he was looking in the direction of Nephi, Utah. Apparently the air traffic controller told the pilot that the object was not detected on radar. The object appeared to keep pace with the aircraft. A Freedom of Information (FOIA) request was written to the Federal Aviation Administration (FAA). About six weeks later we received a response to the FOIA. The response consisted of radar returns, voice tapes and tower logs. The FAA is to be commended for their full and timely response to our request. Research showed that the aircraft was American Airlines Flight Number 434 which was enroute from San Francisco, CA to Philadelphia, PA. 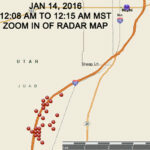 The actual sighting time was between 12:12 and 12:13 AM MST on January 14, 2016. We were able to find segments of the conversation on the Air Traffic Control archives website, but much of conversation was deleted. One could hear the controller telling the pilot that Nephi, Utah was off to his right and the pilot acknowledging the transmission. However, the UFO report was not on the tape. The ham radio operator did not record the conversation so the “UFO report” could not be heard. He heard the conversation on the frequency of 127.95 mhz. 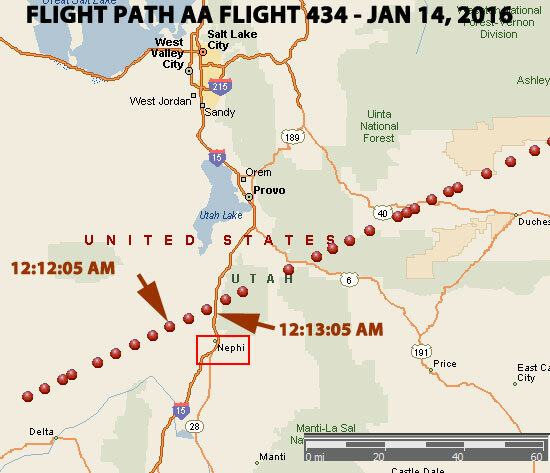 RADAR FLIGHT PATH OF AA FLIGHT 434 OVER UTAH JUST AFTER MIDNIGHT ON JAN 14, 2016. Update: March 4, 2016. 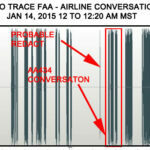 The voice tape obtain from the FAA (see above) does fill in some of the transmission missing from the tape from the Air Traffic Control archives website. The only thing not confirmed from the original transmission was the estimated size of the object. The airline crew described the object as a large orange square. The aircraft was flying at 31,000 feet and 530 knots at the time of sighting. The aircraft was headed in a ENE direction. The radar shows a “dense” area of returns at approximately the 2 o’clock position. These returns are quite isolated and very numerous. They are likely not birds, angels, ground targets or anomalous propagation. The time is from 12:08 to 12:15 AM which is the time that the crew saw the object(s). The map shows a large area of returns near and to the East of I-15. The returns are not traffic as the radar is too far away to detect ground targets. The “zoom out” map shows the concentration of radar returns just to the SW of Nephi. This is in the position and time observed by airline crew. Note that most of the radar map is devoid of returns except in the area immediately to the SW of Nephi. Figure 5 above shows the location of the 2 radar sites used in the analysis. One radar (Cedar City, UT) is about 155 miles to the SSW of sighting location. The other radar (Francis Peak, UT) is about 90 miles to the north. These returns were likely true objects and probably quite large given the distance from the radar sites. RADAR SHOWING PATH OF AIRCRAFT & UNKNOWN RADAR RETURNS. I also took a look at the radar returns for the entire time period of my radar request which was from midnight to 12:30 AM MST. Figure 7 above shows all of the returns for this time period near Nephi. Returns were found for each minute from midnight to 12:30 AM in the sighting area. In all 106 radar returns were detected. This means that the object(s) were there before and after the sighting. The returns in Figure 7 almost look a “gridded” radar map. Figure 8 shows the plot of these returns on a Google Earth relief map. It is fairly obvious that the returns are not due to the radar reflecting from higher terrain. A few of elevations are displayed. There was very little elevation change in the area of the returns. Atmospheric conditions can cause radar waves to bend downward or upward causing “false returns” or showing returns in the wrong location. Also there is a possibility that radar returns may be reflected off of higher terrain. (However, this is generally not the case as aviation radar is designed to not detect stationary targets.) However, Doppler weather radar can detect higher terrain and result in false returns. Figure 8 shows very little elevation change in the area of the returns. 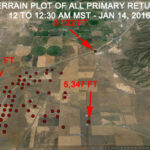 The above slide show of photos taken by Utah MUFON Assistant State Director show no anomalies in area that could possibly cause radar returns. 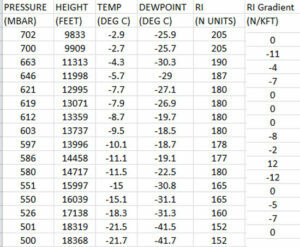 TABLE OF RADAR REFRACTIVE INDEX CALCULATIONS – CEDAR CITY RADAR. Both of the aviation radars were at considerably higher altitude than the target detect area. 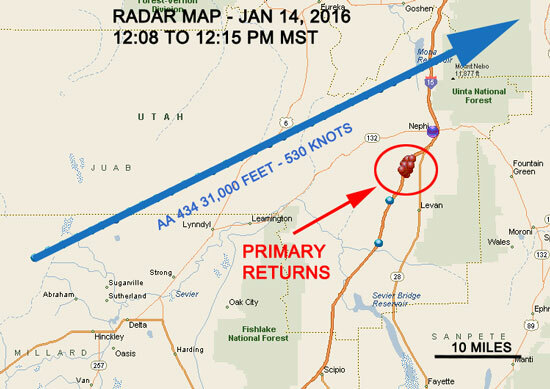 The Cedar City aviation radar (155 miles to the SSW) was at an elevation of 10,760 feet above sea level which is over 5,000 feet higher than the target area. The Francis Peak aviation radar (88 miles to the north) was at an elevation of 9,324 feet which is nearly 4,000 feet above the target detect area. Given this scenario it is unlikely that the radar waves would be refracted abnormally because the waves would be above any surface temperature inversions over lower terrain. Figure 6 shows the locations of the two aviation radars with respect to the target detect area. Figure 10 above is a table of computed radar refractivity gradients/1,000 Feet for the Cedar City, UT radar. Figure 11 is a similar table for the Francis Peak, UT radar. 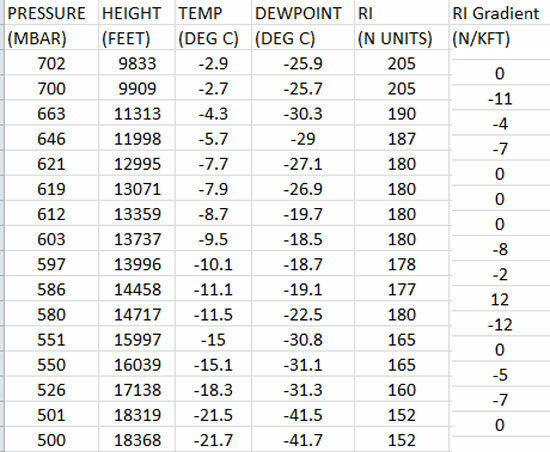 The tables show pressure levels, heights of pressure surfaces ASL, temperature, dew point temperature in degrees C, refractivity index and the gradient of refractivity index per 1,000 feet. 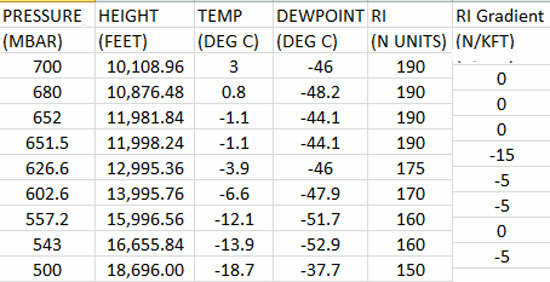 The data were obtained from the weather balloon sounding of the atmosphere from Las Vegas, NV for the Cedar City radar. 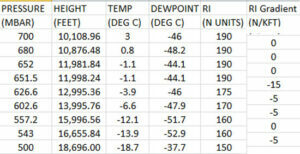 Data were obtained from the weather balloon sounding at Salt Lake City, UT for the Francis Peak radar. For both radar sites the refraction gradients are small and well within the normal atmospheric propagation of 0 to -24/1,000 feet. Given that fact the radars were at high elevations (over 10,000 feet for the Cedar City radar and over 9,300 feet for the Francis Peak radar) and given the values in the above tables the probability of anomalous radar propagation (false returns or returns in the wrong location) is nearly 0. Comments From Martin Shough, Retired Air Traffic Controller & Radar Expert -England: As for the radar, you’re right that those primaries clustered around the interstate are not traffic and AP seems not to be relevant. You might get multiple-trip ghosts from (say) remote mountains appearing at almost any displayed range, but they’d be random with respect to local features. In this case I do get the sense of some correlation with the road, but I don’t know why. I doubt AP would look like this. There’s no significant terrain here. No airfield (although there is a small airfield and heliport to the NE at Nephi). I have absolutely no idea what they are. 1. Pilot reports a large unusual orange square of lights while flying at 31,000 feet. 2. The first conversation where the crew asked if the object was on radar & the FAA responded saying that the object was not on radar was likely redacted (see Figure 1). 3. 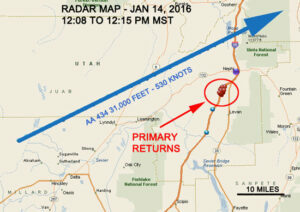 The radar shows a dense area of returns at the exact position and time reported by the pilot. Anomalous propagation generally starts closer to the radar antenna. 8. Birds, weather targets would not be detected in an isolated area that far from the radar sites. 9. Radar angels are sometimes observed. These are false targets, but there would not be that many of them that far removed from the radar sites. 10. The object(s) were likely at the sighting location before and after the time that the crew sighted the object(s). Figure 7 above shows returns for each minute from midnight to 12:30 AM MST. 9. Of course keep in mind that the pilot crew saw a large square area of orange lights so the radar and observation “corroborate” each other. Where Do We Go From Here? Erica Lukes and her team of investigators have ran an ad in the local newspaper to see if other people have seen anything unusual. She conversed with the manager of a local truck stop near the sighting location and was told that UFO’s are frequently sighted in the area. 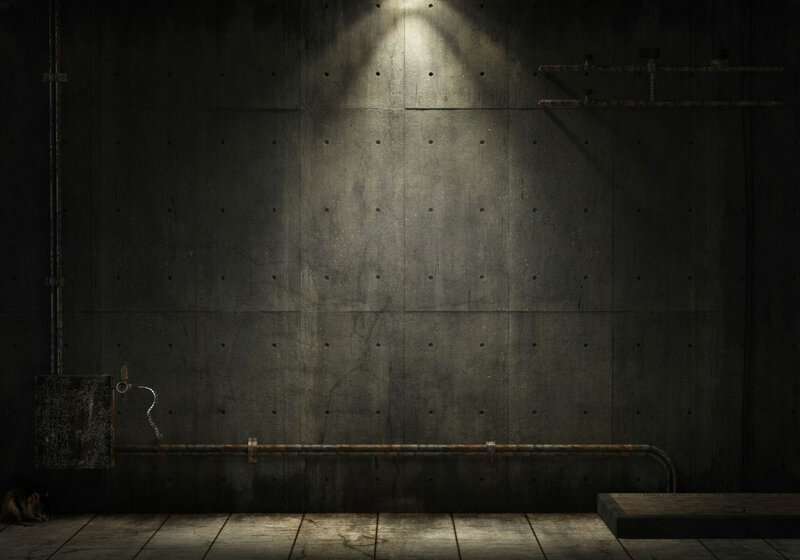 One investigator believes that the crew sighted lights from a local power point (Currant Creek Plant – Mona, UT). To me this doesn’t explain the sighting as the conglomerate of radar returns suggests something unusual. Also I would expect that the same crew had flown this same route before. If this was true, why would they ask the FAA about the location? 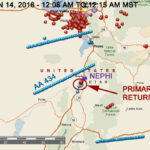 ZOOM IN MAP OF RETURNS NEAR NEPHI. 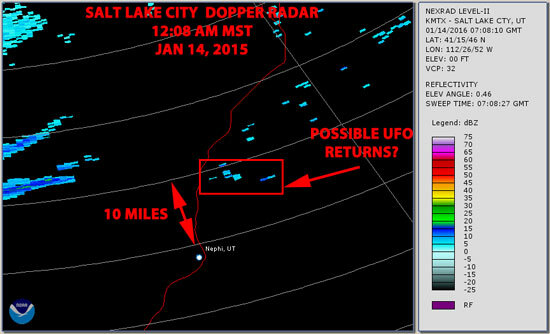 ZOOMED OUT MAP SHOWING ISOLATED AREA OF RADAR RETURNS NEAR NEPHI, UT. LOCATIONS OF RADAR SITE AND POSSIBLE UFO SITE. VISUAL TRACE OF AUDIO FILE. LIKELY “REDACT” AROUND 12:11 MST. TERRAIN PLOT OF PRIMARY RETURNS 12 TO 12:30 AM MST.